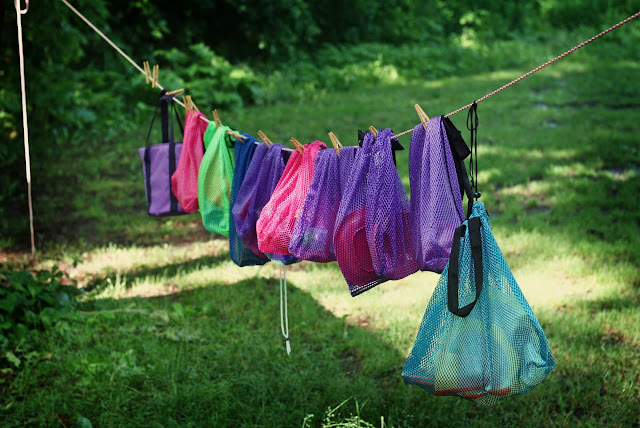 Last Saturday when I went to help my sister out with her Brownies & Sparks group, I stopped at the Shoe Tree in Paris to take a couple photos on the way home. I guess it is (or used to be?) 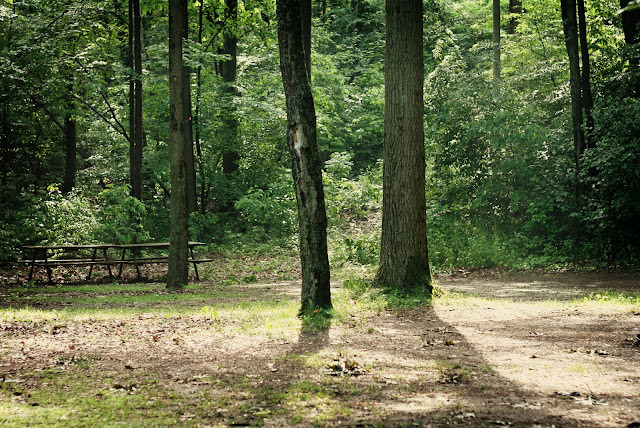 a GeoCache. 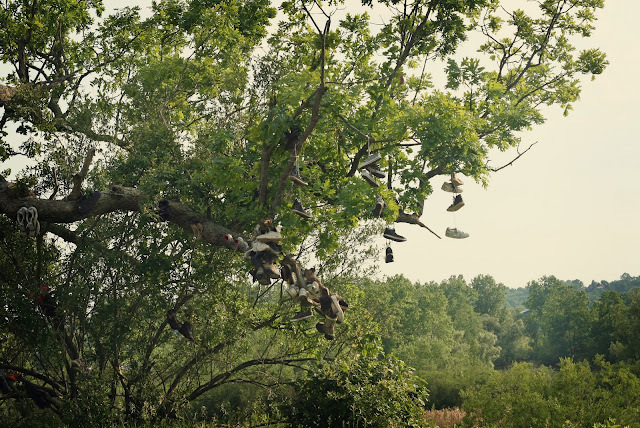 Either way, it's pretty cool to see a tree just filled with old shoes, haha. 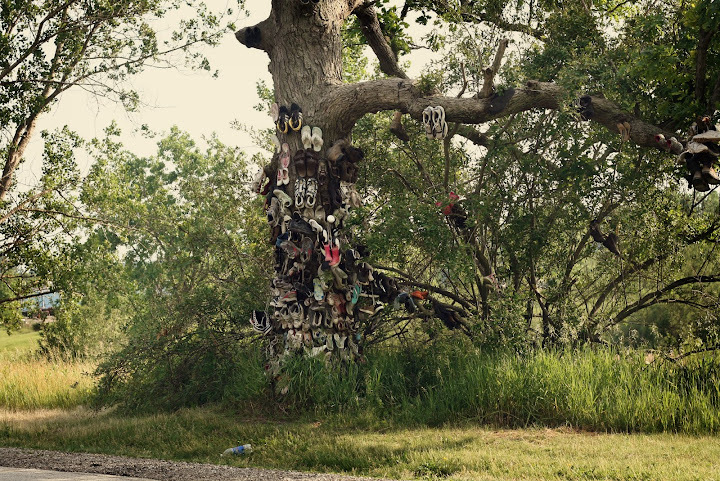 It's funny to imagine people just getting in the car to go put some of their old, worn out shoes onto a tree out in the middle of no where. (This is a pretty empty road that it's on.) 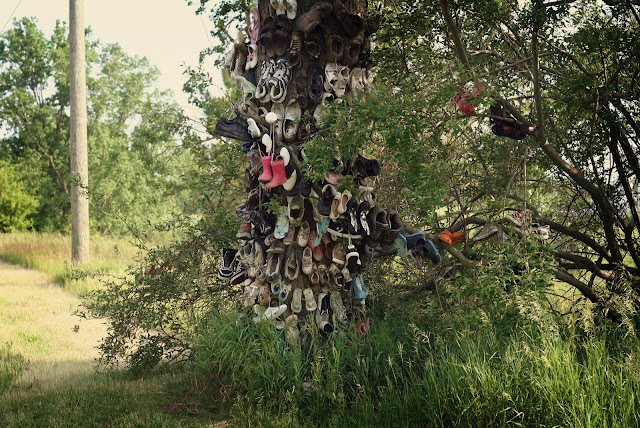 Have you ever come across a shoe tree? Apparently there are quite a few all over the world! This is the first & only one I've ever seen. Pretty cool. I have never encountered a shoe tree, but I would love to see one! It's so weird! You're just driving & then see this tree covered in SHOES! Haha! Wow thats crazy! I never heard of that! That'd be awesome to see! I hadn't either until Keith took me out to see this one! Haha. I hope you come across one one day! My grandma made a shoe tree over the years in the forest behind their old house. They moved so I'm not sure if it's still there or not. Too cool! Did you bring some old shoes to tack on? Ah, no! I should have! Next time! That is SO neat!! I love all the interesting places you go!! So cool! 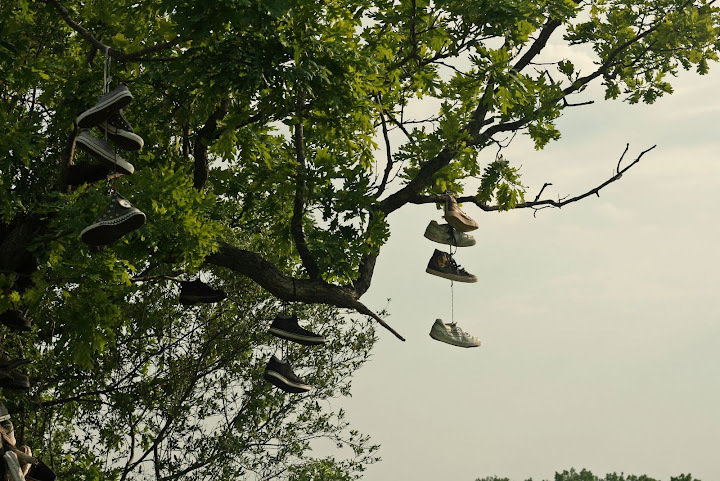 I've never seen or even heard of a shoe tree before now. It's such a weird thing! There was a shoe tree at my college! (The University of Minnesota) It was always my goal to get a pair of shoes on it. I completely forgot about it until reading this post. They are such odd, fantastic things. Ooh awesome! You should go back one day & put a pair of shoes on! 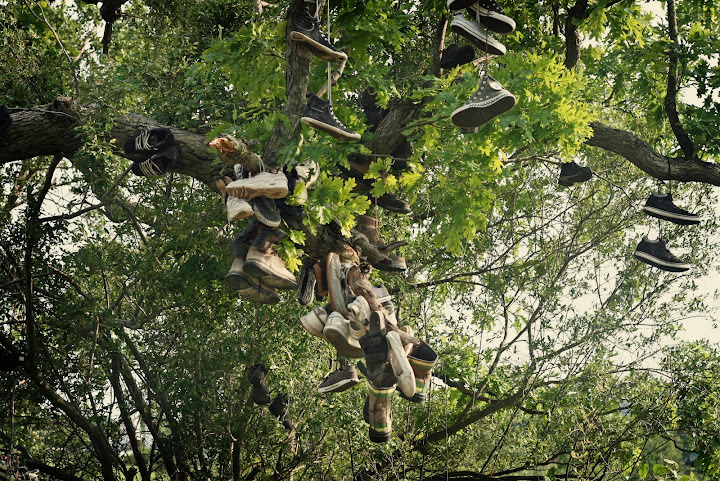 The shoe tree looks amazing! 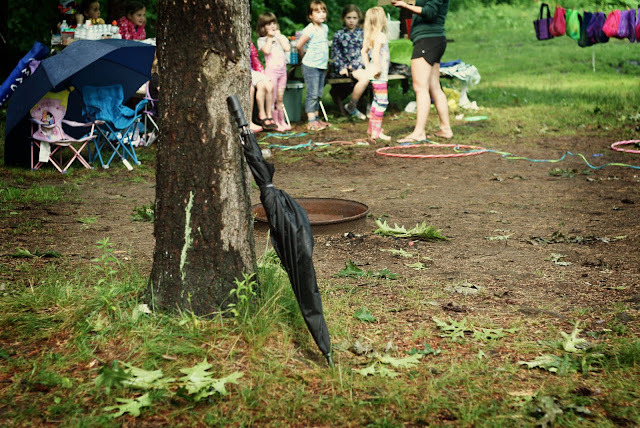 Looks like a scene from a Tim Burton movie. I've never seen a show tree before, but I'd like to! It sort of reminds me of all the padlocks on the Brooklyn Bridge. PS this is my first time reading your blog - just found you through I ART U! It's lovely! Ooh, yeah! I love finding unique things like that in different cities. So cool. Thanks for stopping by! & for the compliment! J is awesome, isn't she? 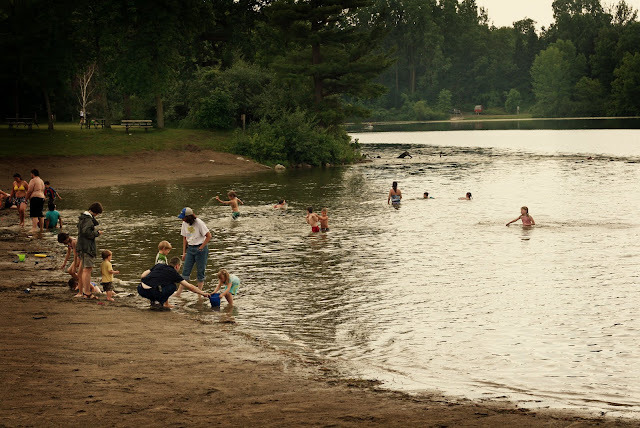 Your photos are always great! And I had never seen a tree like this before, seems like a pretty nice artistic idea!